One of the high priorities of any security plan should include the reasonable mitigation of workplace violence. Some or all of these strategies should be given consideration. Workplace violence program should be appropriate and industry specific. 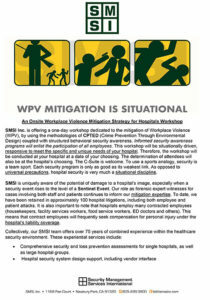 SMSI Inc. is offering a one-day, customized Workplace Violence training program for hospitals and healthcare facilities. This presentation was created to address the specific needs of the facility being served, with due consideration for the ambient threat environment. This presentation will be preceded by an assessment of employee perceptions through the use of an SMSI Likert Rating Scale consisting of 10 questions as well as a current CAP Index Crimecast Report. This presentation takes into consideration that no two workplace violence mitigation programs are, or should be, the same. Security is a situational discipline. The Presenters will be William H. Nesbitt, CPP, Certified CPTED Practitioner and John D. Banja, PhD. Bill Nesbitt is the president of Security Management Service International, Inc. He is a member of ASHRM, ACHE and IAHSS. Bill has done comprehensive security evaluations of hospital from coast to coast over the last 35 years. He has also been retained in numerous litigations as a forensic security expert in cases involving hospitals, for both defendants and plaintiffs. Dr. John Banja is a professor in the Department of Rehabilitation and a medical ethicist at Emory University. He is also an ASHRM member and a frequent faculty member for ASHRM training conferences. He has also been retained in litigation matters in medical malpractice cases, including workplace violence cases. Click to download the introduction to our On-Site Hospital WPV Training offering. Reduction of Security Department Administrative costs, including payroll burden. If you have an interest in this customized WPV mitigation program to your campus, please contact us for further information.